The ageing of population takes place in most countries all over the world. 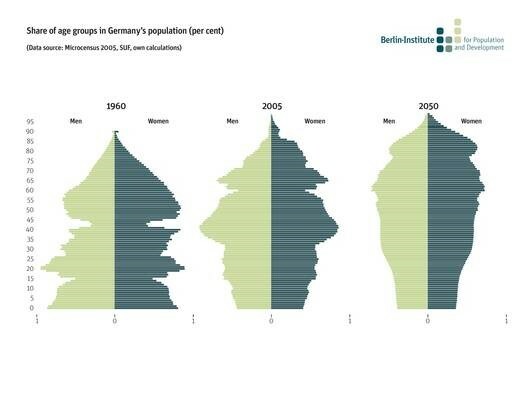 During the next few decades, the share of global population aged 60 or more is likely to rise to historically unprecedented levels (see Figure 1 below). 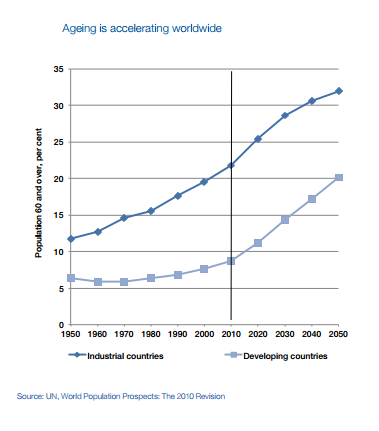 According to the latest estimates, by 2050 there will be 2 billion people aged over 60 (22% of world population). 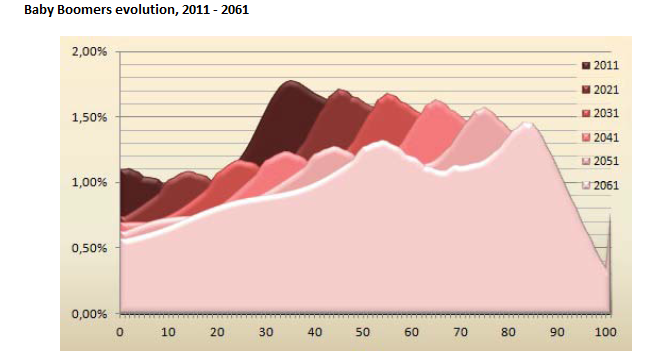 In 2050, world population is projected to be 3.6 times larger than it was in 1950. At a global level, the share of 60+ people will rise from only 8% (200 million people) in 1950 to around 11% (760 million) in 2011; it is expected to reach 22% (2 billion) by 2050. At global level, the share of 80+ people rose from 0.6% in 1950 (15 million) to around 1.6% (110 million) in 2011, and it is expected to reach 4% (400 million) by 2050. The global population is projected to be 3.7 times bigger in 2050 than in 1950, but the number of 60+ people will increase by 10%, while the number of 80+ people will increase by 26%. Between 2010 and 2050 the total population will increase by 2 billion, while the older population will increase by 1.3 billion. 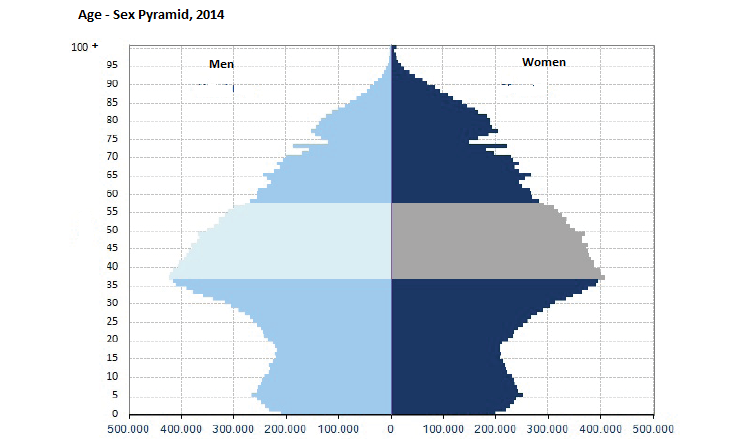 On average, women outlive men by nearly 4.5 years. More precisely, 55% of people aged 60+ are women, and the percentage rises with age: 64 % of the 80+ group of people and 82% of centenarians are women. The ageing process is also affecting China. 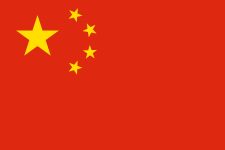 Due to the falling fertility rates and the increasing life expectancy, China is also facing the consequences of its uniquely strict family planning policies and massive rural to urban migration of the working adult population. 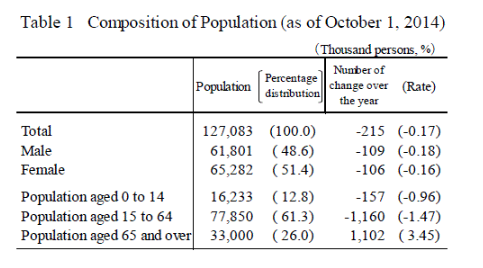 The elderly share of China’s population has been increasing, and people aged 60+ represent an important part of the growth (see Figure 5 below).There are currently 194 million people aged above 60 in China and this number is predicted to increase to 440 million by 2050. By 2050, it is projected that the population aged 80+ will reach 101 million. Today, 37% of China’s population aged 60+ are employed. 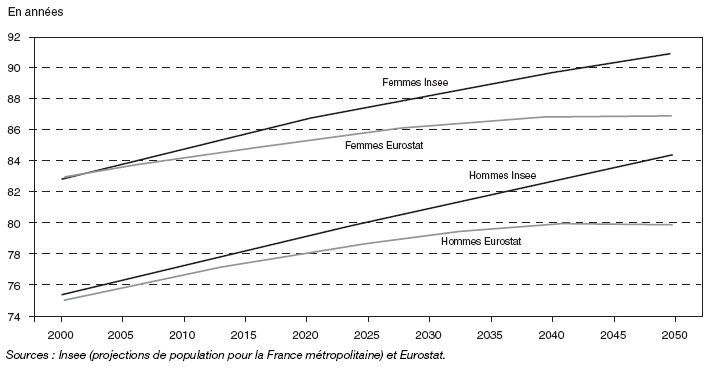 In 2050, metropolitan France will have a population between 61 and 79 million depending on the different assumptions of fertility, mortality and migration. 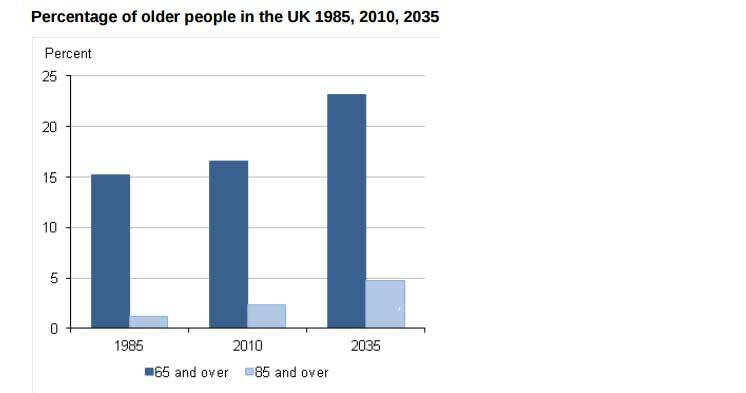 Nearly one in three will be over 60 years old, compared to one in five in 2005. Doubling the number of people aged over 85 is expected over 2005-2020. Although life expectancy in good health is growing faster than the growth in life expectancy itself, the number of dependents is steadily increasing. This inventory clearly shows that the aging population will be a major challenge for the future of our societies. Germany has the world’s 18th largest population. By 2050 it is expected to be the world’s 25th largest population, with a majority of the population aged 50+. In 2013, nearly 27% of the German population was 60+. Germany has the second oldest population in the world after Japan (24.8%) just ahead of Italy (20.8%). This is expected to rise to an estimated 39% of the population by 2050. Germans gain an extra year of life expectancy every three to four years. Life expectancy at birth has doubled during the last century: 78 years old for men and 83 years old for women. Today, there are 26.5 Germans over 65 years old for every 100 persons aged between 15 and 64. 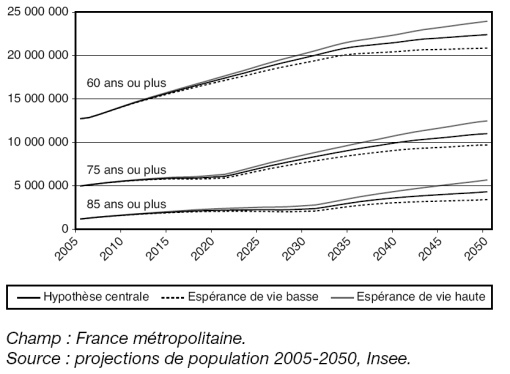 This “old-age dependency” ratio will rise to 39.3 in 2025 and 55.8 in 2050. If several years ago Japan was perceived as a quite young country, today it is no longer the case. On the contrary: Japanese count for the oldest population in the world! According to the United Nations (2000), in 1985 the percentage of Japanese people over 65 years was only 10.3%, which was quite low compared with the United Kingdom that reached 15.1%. Instead, in 2000 the percentage sharply raised up to 17.1 %. Meanwhile the UK population remained quite stable, with 16.0%. 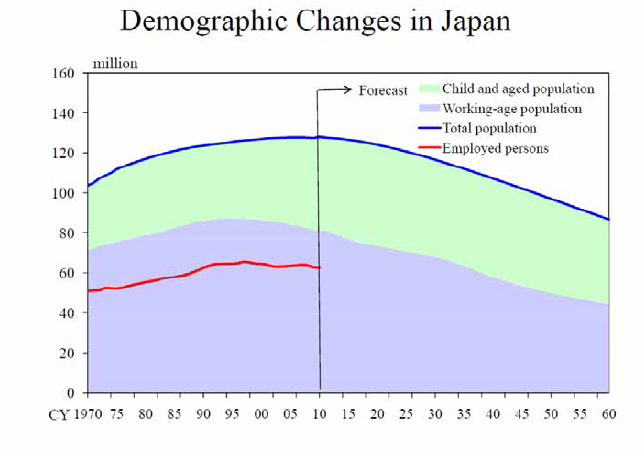 Today, nearly a quarter of the population of Japan is above the age of 65 and by 2060 this percentage may reach 40%. The two main factors contributing to this phenomenon of ageing are the low fertility rate (1,3 children per women in 2014) and an increasing life expectancy, which is the highest in the world ( 86 years-old for the women and 79 years old for the men). 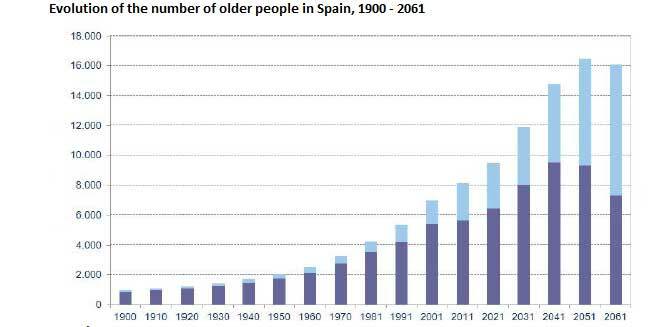 In Spain the population ageing process has been particularly fast. In less than 30 years the number of people aged about 65 years doubled. This process was emphasized by the country’s low birth rate, which began to fall in the mid 70s. According to the Spanish National Statistical Institute. (Instituto Nacional de Estadistica – INE), at January 1st, 2014, Spain was still struggling with its ageing process, with more than 8,442,427 old people (more than 65 years old), which represents 18,1 % of the population. Baby-boomers (born between 1958 and 1977) are now in working age. In Spain, during those years, almost 14 million people were born. Baby-boomers will reach the retiring age around the year 2024. 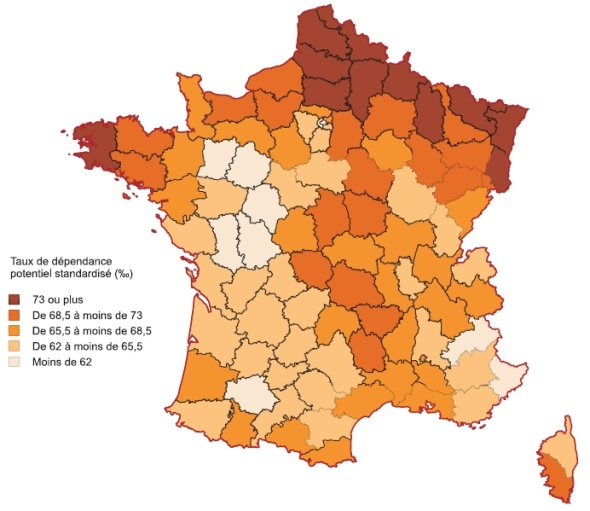 Castile and León, Galicia, Asturias, Aragón and the Basque Country are the Spanish communities with the highest proportion of elderly people (more than 20%). On the other hand, Canary and Balearic Islands and Murcia have the lowest percentage: beneath 15 %. Average expectancy for Spanish women is 85,6 years and for Spanish men about 80,0. It is one of the highest average of the European Union. Source: ABELLÁN GARCÍA, Antonio; PUJOL RODRÍGUEZ, Rogelio (2015) “Un perfil de las personas mayores en España”. Swedish people, on average, are getting older too. 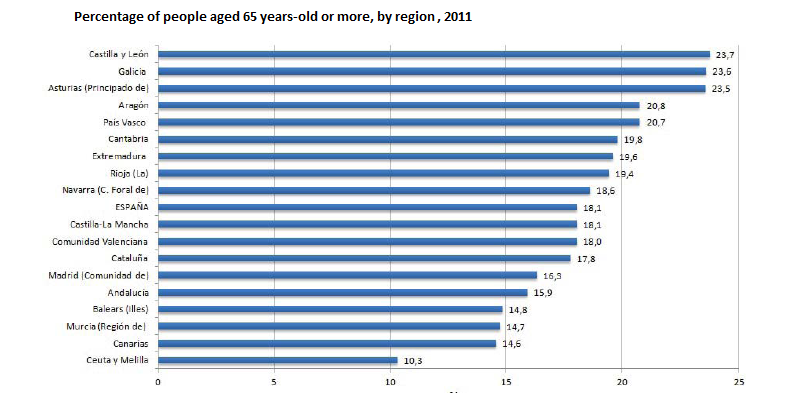 In Sweden and other western European countries, a fifth of the population are 65+. Over the next two decades, the number of 80+ people in Sweden is expected to increase from around half a million to 800,000. 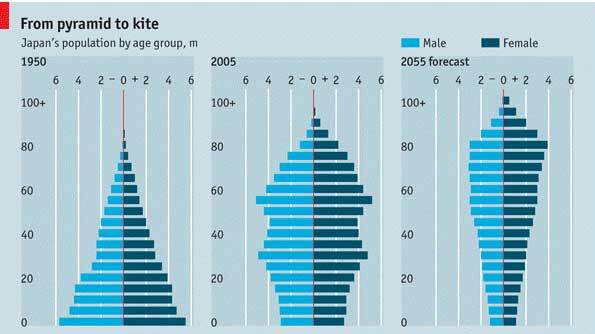 The demographic change is definitely one of the most important long-term societal changes occurring in Sweden. Among Sweden’s 9.7 million inhabitants, 18% have passed the retirement age of 65. This number is projected to rise to 30% by 2030, partly because of the large number of Swedish people being born in the 40s. Life expectancy in Sweden is one of the highest in the world. In 2010, it reached 79.1 years for men and 83.2 years for women. Sweden has the second-largest proportion of people aged 80 or more among the EU member states, with a total of 5.3% of the population. 10 million people in the United Kingdom are over 65 years old. The projections estimate that figure will nearly double to about 19 million by 2050. The number of very old people grows even faster. There are currently 3 million people aged 80+ and this is projected to almost double by 2030 and finally reach 8 million by 2050. Currently, 1/6 of the UK population is aged 65+, and, the projections by 2050 will grow to reach ¼ of the UK total population. The pensioner population is expected to rise. In 2008 there were 3.2 people of working age for every retiree. This ratio is projected to drop to 2.8 by 2033. 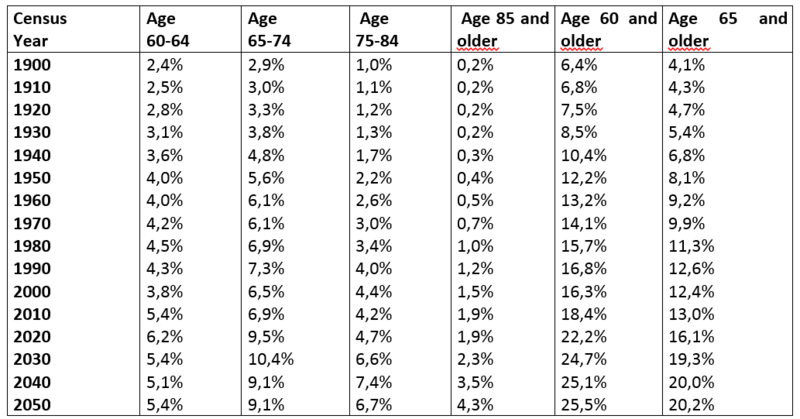 Like the rest of the world, the US is an ageing society (Table 1 above). Between 2000 and 2050, the number of old people is projected to increase by 135%. Moreover, the population aged 85+ (which is the group most likely to need health and long-term care services) is projected to increase by 350%. 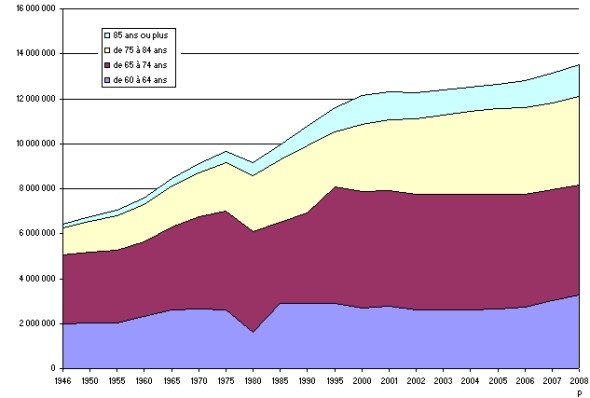 This graph shows the increase in the percent of the population 60+ from 6% in 1900 to 16% in 2000 and projected to be 25% in 2030. It is likely to reach 26% in 2050.